The Culinary Hoppers team's event for this month is "Bengali cuisine". 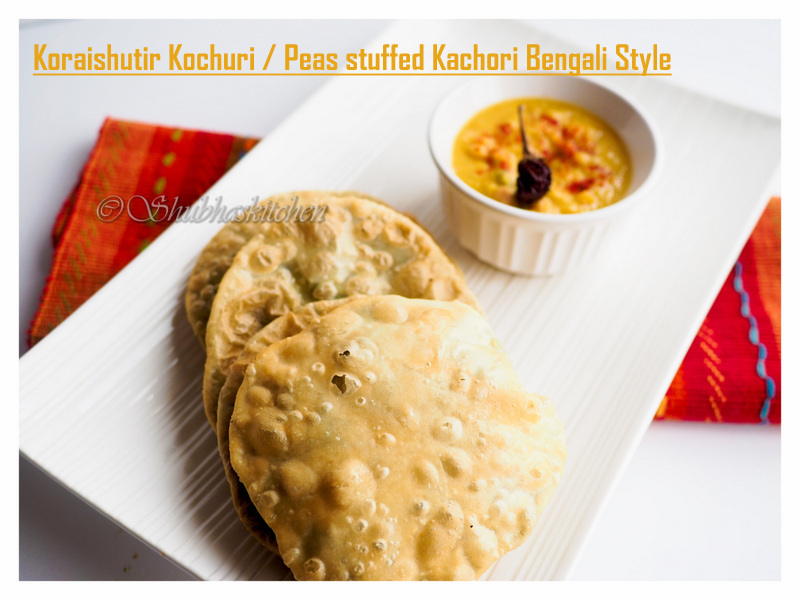 Though I had tasted Bengali dishes but I had never cooked them in my kitchen. 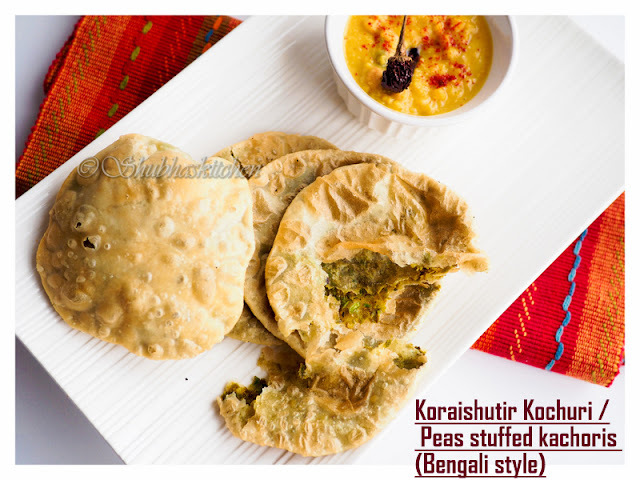 After researching a few recipes, I decided to make a dry curry "Bandhakopir Torkari" , Lentil based curry "Cholar dal", A flat bread "Luchi", a stuffed puri "Peas stuffed Kochuri / Kachori" and a yogurt based sweet dish "Bhapa Doi". 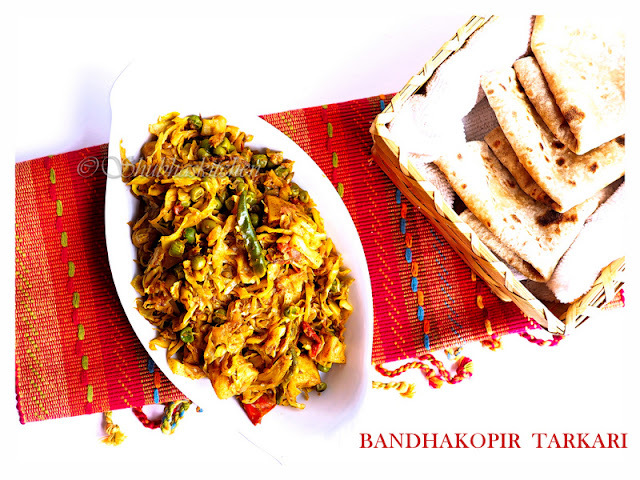 This is an easy to prepare dry curry /sabzi prepared from cabbage. 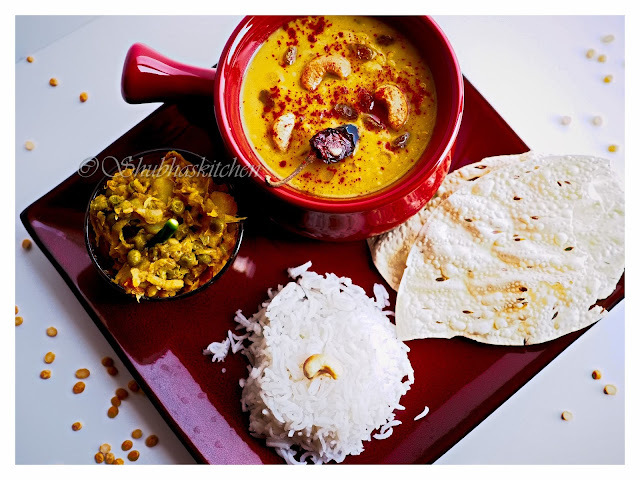 Wonderfully flavored, this dish tastes great with steamed rice or any flatbread of choice. 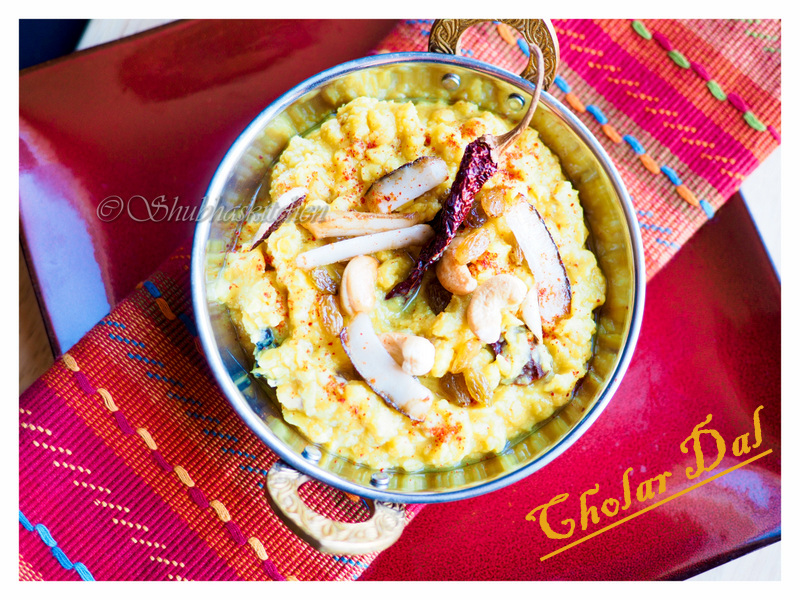 Cholar dal is a mildly spiced creamy lentil curry prepared from split chickpea. 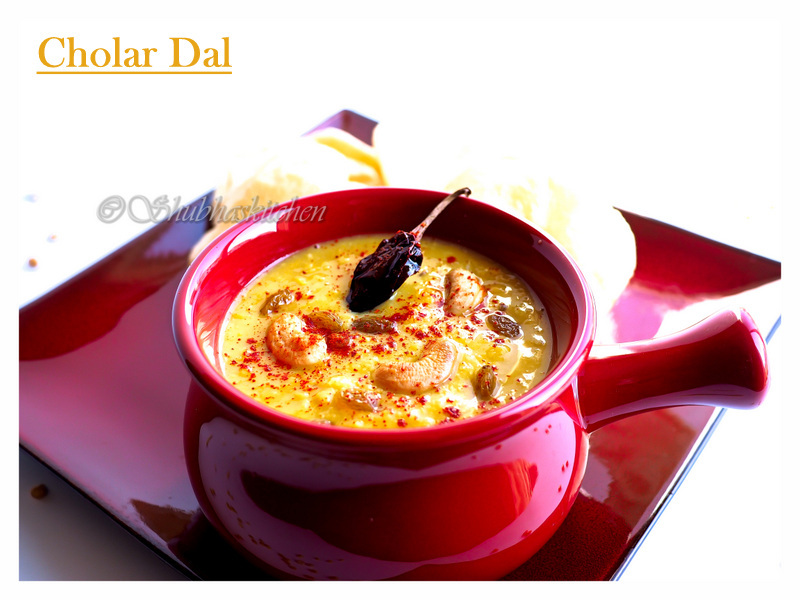 This dal can be served with rice or as an accompaniment with luchi or kochuri. Oil for deep frying . Add salt and oil / ghee to flour. Mix it gently with your finger tips until the flour gets coated with fat (oil/ghee). Add water little by little until you arrive at a smooth dough (Note : The dough should be too lose). Cover the dough and let it rest for a good 20 minutes. Once well rested, divide the dough into 8 equal parts. Make balls. Heat oil for deep frying. When hot, add the rolled circle. The luchi will start to puff up. With the help of the back of the spoon, press the luchi so that it puffs up properly. When one side has attained a nice creamy color and the oil had stopped sizzling, flip it to the other side and fry the other side. 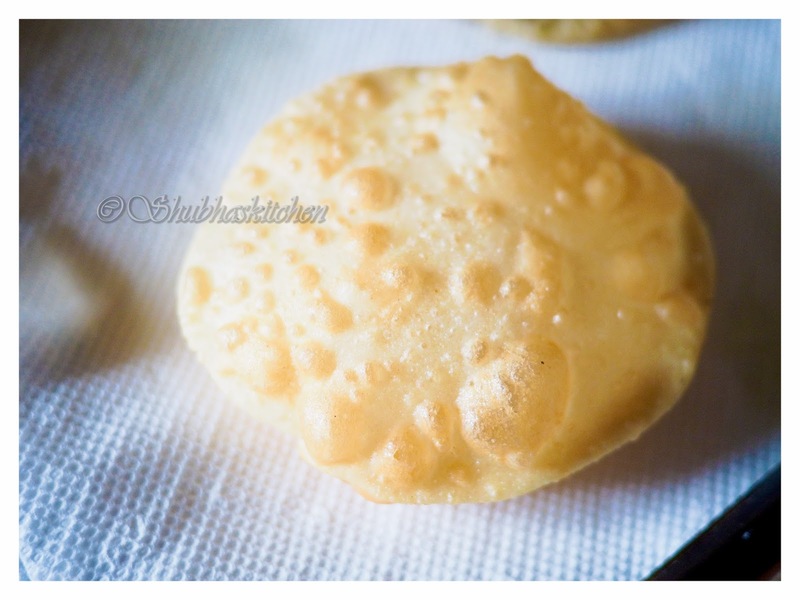 Take the luchi out from the oil and place it on a plate lined with paper towel to drain off the excess oil. Repeat the same process with the other dough balls. 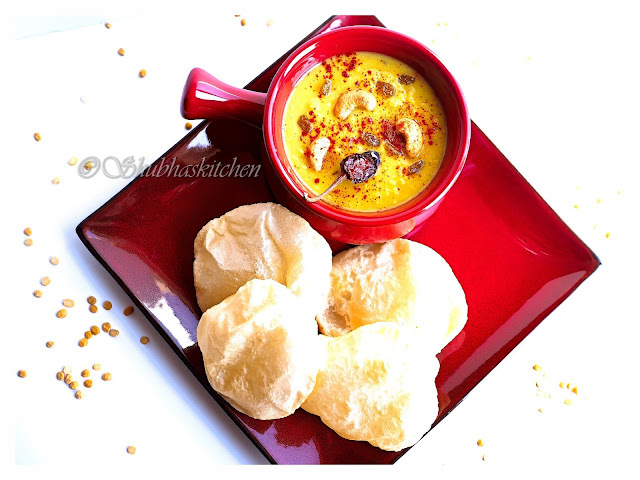 Serve hot luchi with Cholar dal and any vegetable curry. To prepare the outer cover for the kochuris, take the flour, 1 tbsp oil/ghee and salt.Mix it gently with your finger tips until the flour gets coated with fat (oil/ghee). Add water little by little until you arrive at a smooth dough (Note : the dough should be too hard nor too lose). Cover the dough and let it rest for a good 20 minutes. While the dough is resting, lets prepare the filling. 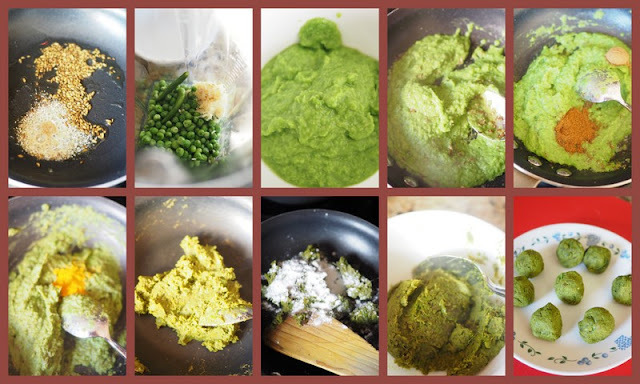 Grind together, the green peas, green chillies and ginger in to a smooth paste. Now take 2 tsp oil in a pan. When hot, add the fennel seeds . When the seeds splutter, add the asafoetida. Add the ground peas mixture. Add the cumin powder, garam masala and salt. 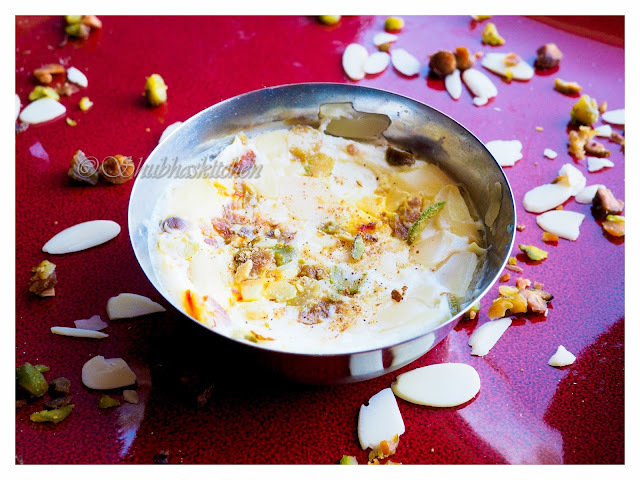 Cook the mixture on low-medium heat until the moisture from the mixture evaporates. 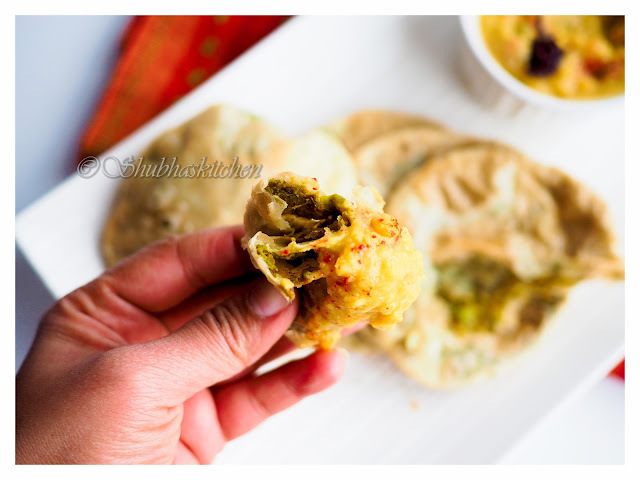 Sprinkle some rice flour (you can use chickpea flour/ besan instead) to help to remove the moisture.Once the mixture is ready, set it aside to cool. Once cooled, divide the mixture in to 8 small balls. After the dough has rested, take it on a working surface. Knead it again and roll into a long log. Divide it into 8 equal parts and form them in to balls. Now take one ball and roll it into a small circle. Keep the peas mixture in the center. Bring all the sides of the dough closer together so that it covers the filling properly. Seal it well and set it aside. Repeat the same process for the rest of the dough balls and the green pea mixture ball.Keep them covered. Heat oil for deep frying. 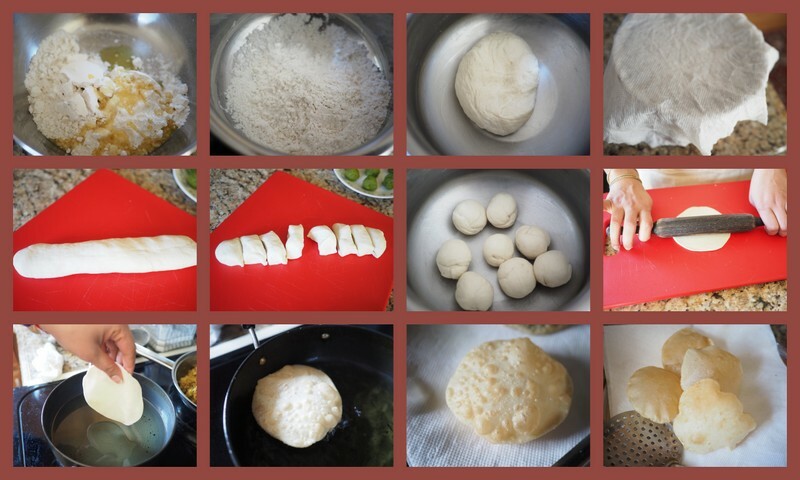 Now take one of the stuffed balls and with sealed surface on top, roll it carefully into a 3-4 inch circle. Once the oil is hot, carefully put the rolled circle in to the oil.It will start puffing up. Press with the back side of the spoon to help it puff properly. Once it is nice golden, flip it to the other side and fry the other side. Once done, take the kochuris out into a plate lined with paper towels to drain off the excess oil. 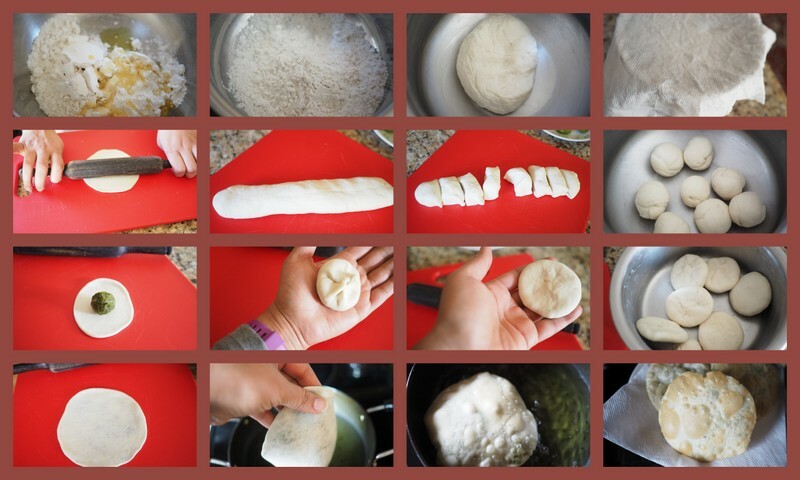 Roll the other stuffed dough balls in the same way and fry. Serve kochuris with Cholar Dal. Take condensed milk in a mixing bowl. Add the whisked yogurt and milk .Mix . Add the chopped nuts. Also add the cardamom powder and saffron. 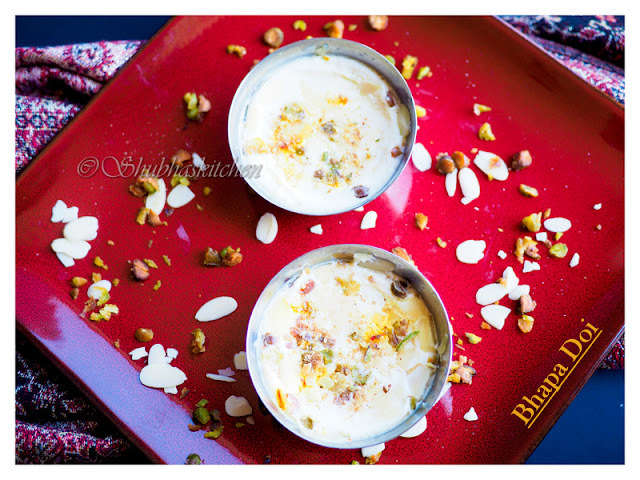 Transfer the contents into a individual ramekins or bowls. Cover with an aluminium foil and place it on the steamer.Steam for about 20 minutes. 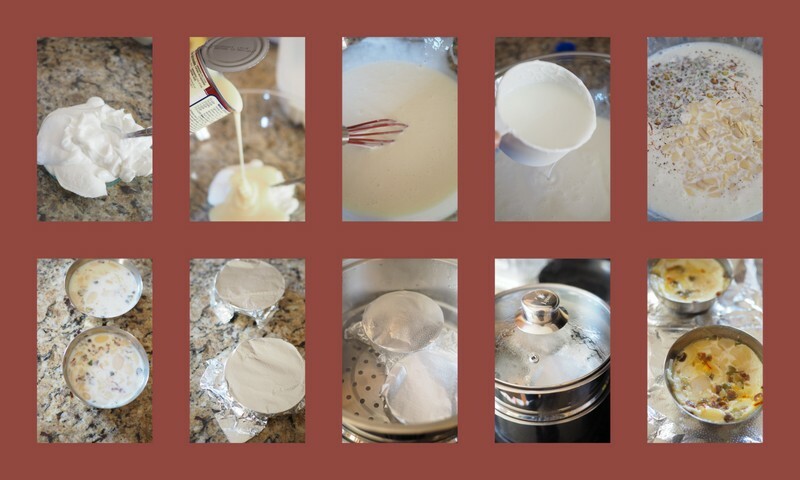 Once done, remove the ramekins/bowls from the steamer and bring it to room temperature.Later, cool it in a refrigerator until completely chilled. 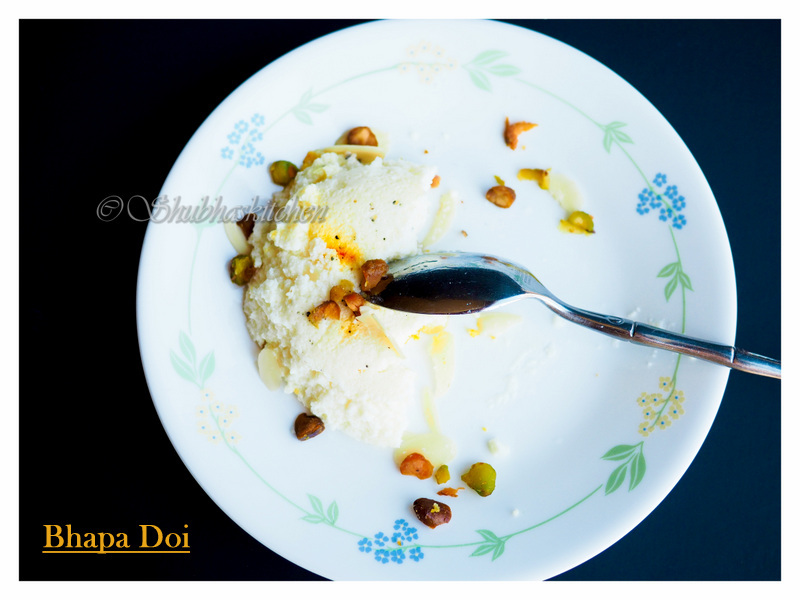 Do check out many more delicious recipes from the other members of the Culinary Hoppers team. 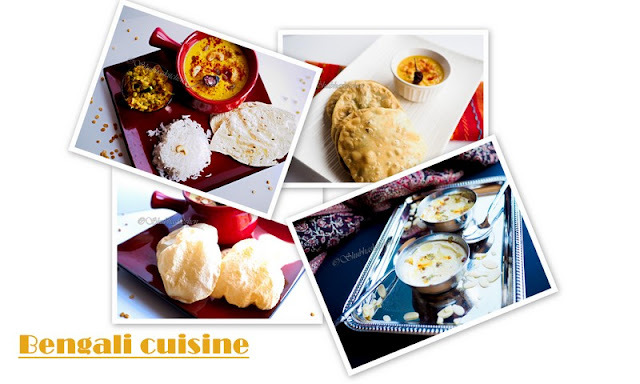 Piyali (Bengali Thaali), Padma (Luchi, Spicy Cauliflower Curry & Misti Doi) , Jayashree (Ghughni chaat), Vani (Nimki), Parvathy (Sweet potato Posto), Poornima (Dhokar Dalna), Shobana (Aloo kumro). What a stunner of a post this is Shubha. Believe me I had goose bumps of nostalgia reading through it. My eyes were swelling with emotion and my heart felt warm at your words which had so much of love for this cuisine. I honestly don't know where to start. Am in a frenzy of sorts as I look at all the dishes. You have put a lot of passion coupled with your inherent creative skills to dish out such a delectable and visually gorgeous array of dishes. Okay let me start from the Kochuri. Honestly it looks absolutely brilliant. You have nailed it to the T and I am happy beyond words and so grateful that you chose to refer to my recipe. Thank you sweetheart. It means a lot to me which I am failing to express in words right now. Such acts of love leave me speechless and teary eyed. I truly don't understand what way my words should go after this. I have always maintained, you, being a huge blessing in my life and trust me this month is one where I am down in the dumps emotionally every year. You brought in so much of comfort and happiness to me with your generous act again endorsing my words of me being extremely lucky to have you as a friend. The rest of the dishes be it the Bhapa Doi, luchi, Bandhakopir Torkari, Cholar Dal oh dear dear has teleported me to food heaven. I am not the least bit exaggerating when I say each dish looks being made by someone who has a mastery over them. Perfect and supremely delicious what I can say to summarise them. You have brought utter brilliance with this spectacular post of yours. Hats off and thank you. Mouthwatering and if possible, I want to taste all of it. Superbly executed and what a splendid post!! All the dishes are so delicious and I'm already drooling over here. You have perfectly captured the essence of bengali cuisine!! Wow! It looks like you have mastered all the dishes and perfected..Such a beautiful platter and delicious looking pictures.. Beautiful! Awesomely Awesome Shubha! 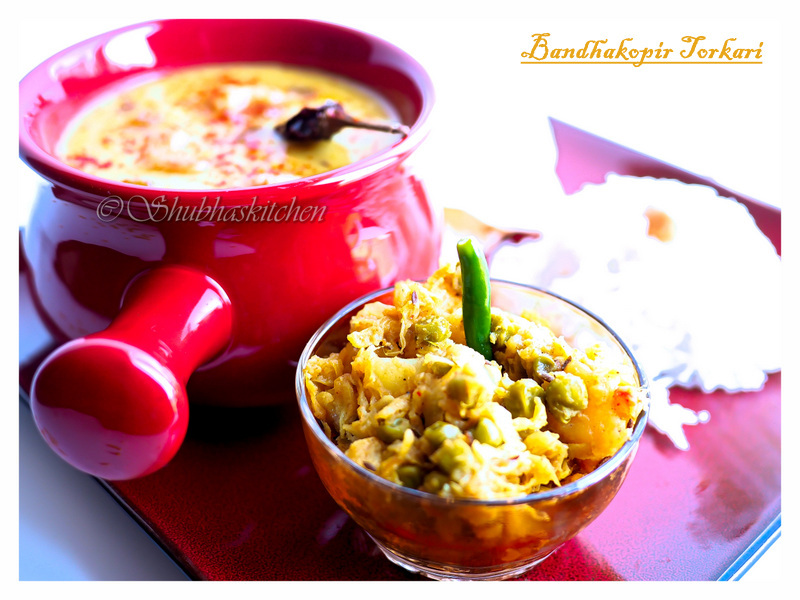 All delicious Bengali recipes and such a beautiful clicks! I must say you have done such a hard work in compiling this post..Kudos!!! 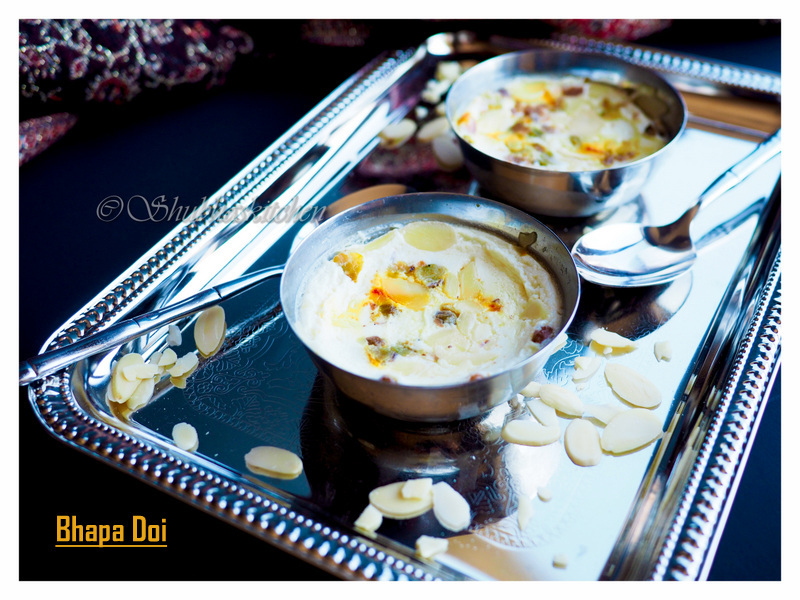 Its really amazing to watch those lovely dishes.I am too drooling with Jaya.Will surely bookmark and try soon. This Indian cooking can be found in Punjab and it's somewhat like Mughlai food from the North West boondocks.